Works on the Evans Road level crossing removal will be fast-tracked with a new road bridge to begin this year and completed by 2020. Evans Road has been closed at the level crossing since 2005, dividing the communities of Lyndhurst, Lynbrook and Cranbourne West, and forcing drivers to take lengthy detours. When Evans Road reopens, it will reconnect communities making it up to four times faster to travel across the rail line to the South Gippsland Highway. The level crossing removal complements several upgrades on the Cranbourne line that will boost road and rail capacity and make travel easier. Minister for Transport Infrastructure Jacinta Allan joined Cranbourne joined MP Pauline Richards site and residents at the Lyndhurst site on Thursday 13 March. 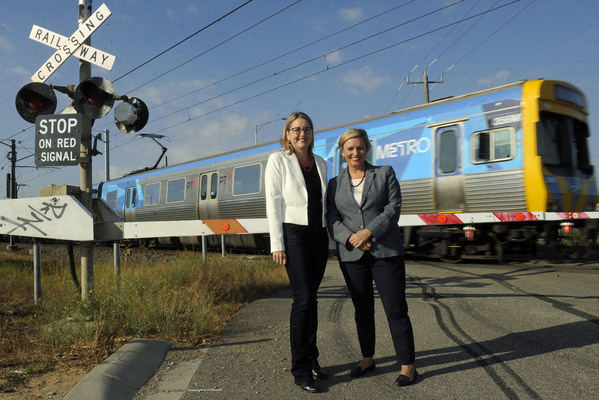 “We are getting on with the job of removing the last four remaining dangerous and congested level crossings to help people get home sooner and safer,” Ms Allan said. Major upgrades to the nearby intersection of Evans Road, Hallam Road and South Gippsland Highway, along with the removal of the level crossing, will enable Evans Road to reopen. 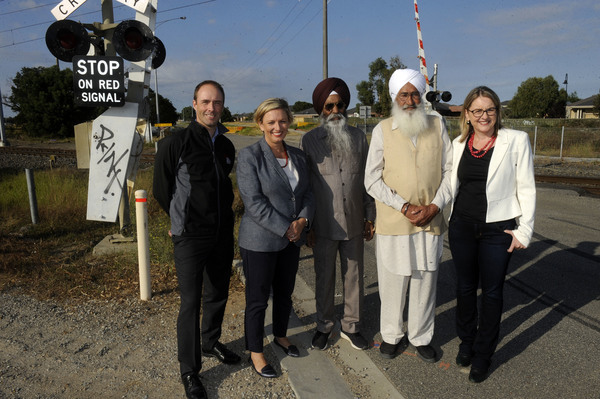 Three more level crossings located at Webster Street, Camms Road and Greens Road will go, making the Cranbourne line the first to be level crossing-free. Site investigations are underway to duplicate eight kilometres of single track between Dandenong and Cranbourne by 2023. Ms Allan said the duplication will remove bottlenecks, enable trains to run every ten minutes, and pave the way for the line to be extended to Clyde. The area will also benefit from the Thompsons Road Upgrade with 4.3 kilometres of new lanes set to open in mid-March between Dandenong – Frankston Road and Lyndhurst Boulevard along with the newly signalised Westernport Highway intersection. Duplication road works and twin three lane bridges over the Cranbourne line are to set to open in mid-2019. Safety improvements at one of Melbourne’s most notorious intersections will also be fast tracked as part of the project following the installation of traffic lights at Dandenong-Frankston Road by early 2020. Casey Mayor Amanda Stapeldon said she was thrilled the project had been made a priority. “The community deserves this and they’ve waited long enough,” she said. “I’m really grateful for Pauline Richards for fast-tracking this, making it a priority as it absolutely should be. “The project will also restore a vital connection for the local community, giving drivers, pedestrians and cyclists easier access to facilities and services on either side of the rail line, and will create hundreds of jobs during construction,” Cr Stapledon added. A community information session will be held on Saturday 30 March at the Lyndhurst Primary School between 10am and 12pm.